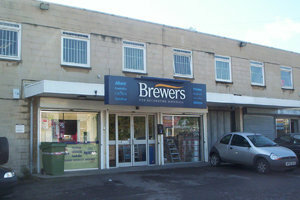 Brewers Decorator Centre in Bath stocks a good number of trade and designer paint brands, a large selection of wallpaper books and various decorating tools and access equipment. What we don’t have in stock, we can soon order in for you. As well as what’s in store, visitors can explore the full range of wallpaper and designer paints online from a customer internet terminal. And whether you’re an expert tradesperson or a novice DIYer, our team is always happy to give specific product insight. You’ll find us on Bath Trade Park, Westmoreland Station Road, immediately after the large Jewson store. We’re just a few minutes’ drive from the A36 Lower Bristol Road, via Westmoreland Road. There’s lots of customer parking outside, the store is fully accessible to wheelchair users, and we can arrange local delivery if you can’t make it in to collect.